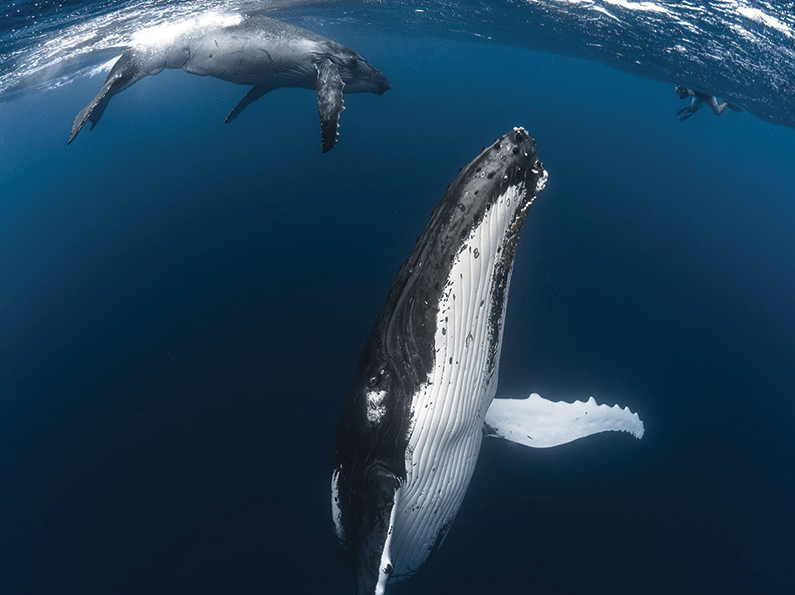 Whale watching has become an attraction and even a “must see” on a global scale. Some travelers have become real enthusiasts who run the world to see cetaceans wherever they can be seen. Whale watching has become a true tourist niche product for destinations that, like Tahiti and her islands, can offer this activity to their visitors. So yes, we may wonder why? In fact, that strong interest and growing popular sympathy for the whale itself along with its mysterious peregrinations around the globe, constitute a true societal phenomenon. This phenomenon itself is certainly due to the global awareness campaigns that have been launched over the past 20 years. Indeed, by questioning the conscience and the sensitivity of everyone, these campaigns have largely contributed to drawing the attention of the peoples of the whole world on the sad fate of these poor whales that are still savagely hunted in some countries, as well as on the risks of disappearance that still threaten several species of cetaceans. That quasi-unanimous feeling of our visitors is not surprising and just reflects reality: For if it is absolutely true that whales can be observed all over the world (and especially during the period of farrowing), there are few seas, latitudes and general configurations in which whale watching does not mean cold, discomfort and feeling of insecurity … And it is precisely there that Tahiti and her islands impose themselves as one of the safest and most pleasant “whale watching” destinations in the world: Our islands allow visitors to observe the whales in their own majestic oceanic environment, which serene immensity fascinates and deeply soothes. The scenery that serves as a setting for whale watching expeditions is that offered by the paradisiacal shores of either high islands with reliefs covered with flowering trees, or atolls deploying around them the emerald halo of their immense lagoons. The expeditions always take place under the particularly pleasant climatic conditions of our Polynesian “winter” (the period of whale watching is between July and October), with very mild temperatures varying between 27 and 28 degrees Celsius; the temperature of the water being about the same, which greatly facilitates the practice and the unforgettable experience of the “whale swimming”, whenever your guides judge that the whales are sufficiently peaceful to accept the presence of divers in their perimeter. If the conditions of the whale watching expeditions are pleasant for visitors, they are also good for the whales themselves as they in our waters, benefit from an ideal biotope with a temperature perfectly adapted to the fragile metabolism of newborns and above all, peace and security guaranteed by local regulations (the Polynesian Environmental Code is in force since 2002) and the official creation of a 4 million square kilometers (one of the largest in the world) marine sanctuary by the Government of the Country . There is no shortage of whale-watching activities (and occasionally whale-swimming). All are professional and take pride to complying with the law and the safety standards governing the approach of whales, including the perimeters to be respected. In season, some diving clubs also offer this activity.